Apocalypse Film’s debut feature film, 2008’s The independent. Co-Written and Directed by Andrew O’Keefe and John Studley, produced by Jim Xyga, The Independent at screened at 30 cinemas throughout Australia for up to six weeks at some cinemas. Apocalypse Films independently distributed the film choosing the release to coincide with Australia’s 2008 federal election , thus capitalising on the political zeitgeist. The strategy worked with many cinemas playing the film throughout the election month. The critical response to the mockumentary comedy was mostly positive with many reviews singling out Lee Mason’s performance as Marty Browning as the loveable but troubled political candidate. 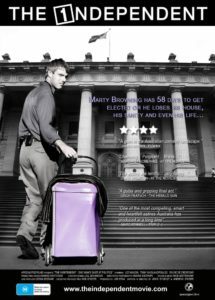 Australia’s preeminent film reviewing couple, Margaret Pomeranz and David Stratton called the film “Charming… poignant… brave”. Film Ink labelled it “A gem in the Australian comedy landscape”.